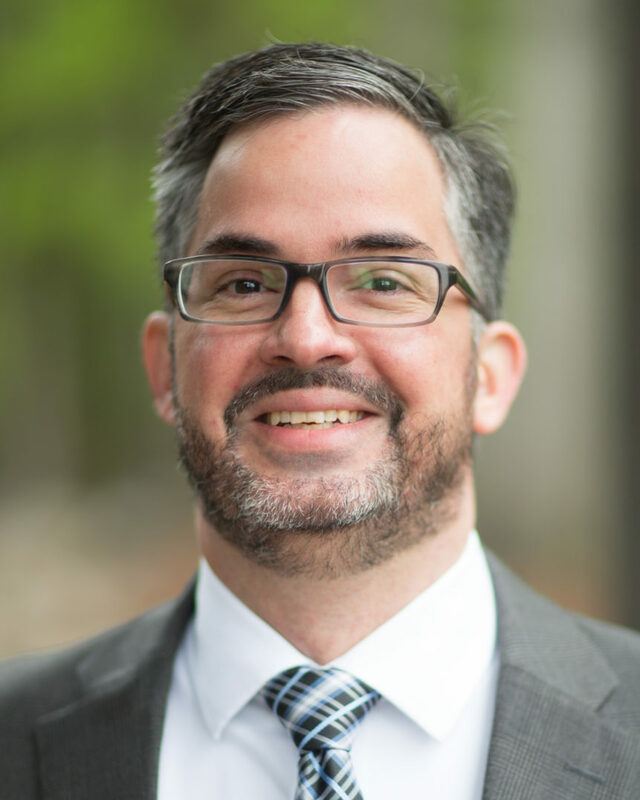 Our long- time CFO, Matt Deeb, is leaving The Trust in early May to work for a local investment firm. His career began with the then Baptist Healing Trust on March 1, 2004. Many of you know Matt as a patient budget coach, a financial guru, and as the lone male on our staff. Around the office, Matt is known for his sense of humor, flannel shirts, and love of movies, camping, and musical festivals. We set aside a few minutes during his last few weeks at The Trust to reflect on his 14 year tenure and his future plans. What are some of your favorite memories from your time at The Healing Trust? It is frankly hard to remember my life before THT. My time here has been so wonderful and rewarding. I get to work with some of my favorite people on a daily basis. We have been through a great deal together, and most of my favorite memories are of the accomplishments we achieved together. We have such great comradery and I will treasure my memories of supporting each other during tough times and the countless fun and silly moments we have shared. I was at a cabin in North Georgia on Halloween in 2015 and started receiving pictures on my phone of the team dressed as another co-worker. Our former CEO, Cathy Self, and our former intern, Leah, decided to dress as the casual and professional version of me. 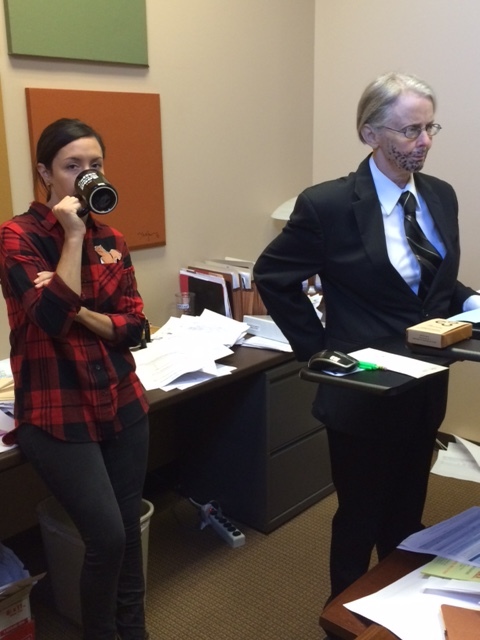 The picture of Cathy at my desk in my suit with a drawn on beard was priceless! The rest of the pictures that day were equally amazing and ridiculous. Those pictures are definitely in the Deeb photo album. I’ll also always remember moving into our office space on Sidco Drive in May 2013, settling the lawsuit in October 2016, Cathy’s surprise retirement party, and watching my long-time co-worker and friend, Kristen Keely-Dinger, appointed as our new CEO. Plus, I am the unofficial godfather of 5 staff babies that arrived during my time here – it is a lot of responsibility! It has been fun to get to see the kids of THT grow up. What has surprised you most about working here? Private foundations were not on my radar when I lucked into this job. My first role at The Trust was Accounting Manager and I knew very little about investing or grantmaking when I started. Almost everything about our work was surprising to me from my background in public accounting and internal auditing. My work in public accounting was almost exclusively for non-profit clients and I have always had a heart for this sector. But I have learned so much about the incredible work of our non-profit partners and the efforts being undertaken to serve our community. Getting to participate in the grant review process is how THT put its hooks in me. I loved reading the needs assessments sections in grant applications because it opened my eyes to issues I was unaware of and provided a sense of scope for those that I did. It has been so wonderful to get to meet and work with the passionate leaders and teams of our non-profit partners. What excites you about your new role? I am looking forward to advising clients on their investment portfolios and helping them reach their goals in my new role at an investment firm. Investing is the engine of philanthropy for private foundation, and I was drawn to learn more about this discipline that was so critical to the impact The Trust has in our community. In June 2013, I decide to pursue the Chartered Financial Analyst (CFA) designation which is a well-respected investment management designation. I passed the third and final portion of the CFA curriculum in the fall of 2016. Making it through the CFA process was a heavy lift for me and made me want to learn even more and to get an opportunity to manage investment portfolios. I announced last year that I was interested in pursuing an investment career, and was very fortunate when a position opened at the firm of one The Trust’s long-time board members. What lesson(s) from The Trust will you take with you? Working at The Trust has been such a transformational experience for me. Cathy taught me so much about the importance of organizational culture and shared leadership. She is a servant leader and instilled that philosophy in all of us who worked with her. I will also carry forward all that I learned about the work of our non-profit partners and the relationships I formed with them. Matt’s last day at The Trust is May 4, 2018. We wish him all the best in his new endeavors.